And you don’t need to be Albert Einstein to second his words “Everything should be as simple as it can be, but not simpler.” At the age of information overload, simple is all we have space for. 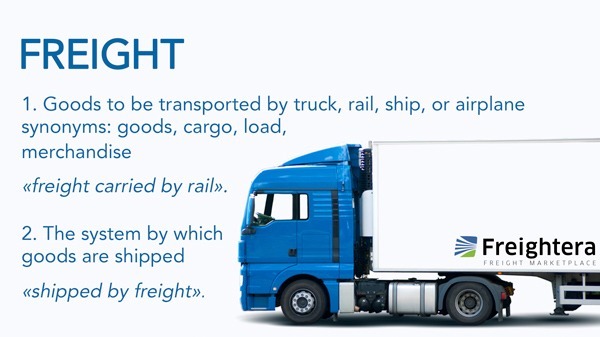 We’ve created Freightera’s Glossary of Freight in simple visual format. It consists of freight terms with images and definitions. Simple as they can be, but not simpler. Start here, enjoy and share with your friends, colleagues, customers, and students! Any inconsistencies between the actual shipment and what is stated on the BOL (aka bill of lading). They may result in additional charges for the shipper from the carriers. The transportation of freight has weight limit. When talking about axle load, it refers to the weight limit allowed for each axle over the highways. A carrier's return trip, where carrier can offer customers a lower shipping rate, or backhaul rate, to fill the empty truck. About 80% of truck on the roads are returning empty. A request for the carrier to call ahead of pick up. A carrier is a person or company that transports goods using their own assets: trucks, trains, ships, or airplanes. If you're a carrier, join us for free and get new orders now! Each product is given a class ranging from 50-400 (determined by the National Motor Freight Traffic Association) based on its density and its assumed risk/liability for hauling. Entity who is the buyer and generally the receiver of a freight shipment. When several shipments are combined to save on freight shipping costs. A container is a large metal box used for the transportation of freight by road, rail, sea, or air. The standard length are 20ft (6.06m) and 40ft (12.2m). Containerization The system of intermodal freight transportation using intermodal containers of standardized sizes. Containers removed the need for manual handling and warehousing at ports. A crate is a large container with four walls and a bottom, with or without a top, used for transporting and/or storing large, heavy or fragile items. Total volume inside a truck, train, or ship, measured in cubic feet. A customs broker is a licensed person or company responsible for clearing goods through customs on behalf of importers and exporters, usually businesses. Freight shipment’s length, width and height. Measure the largest dimension for every axis. Eco-Driver Training Training to drive more economically, reducing fuel consumption and cost. Includes better planning, smoother driving, using optimal revs, reducing air conditioning and idling. Expedited freight refers to the transportation of goods that are time sensitive or perishable and need to be shipped immediately, such as frozen fish, fresh fruit or samples that need to be tested urgently. A forklift is a powered truck used to lift and move goods short distances. Indispensable in manufacturing and warehousing. Also called a fork truck, a lift truck, or a forklift truck. 1. Goods to be transported by truck, rail, ship, or airplane Synonyms: goods, cargo, load, merchandise "freight carried by rail". 2. The system by which goods are shipped "shipped by freight" . A freight broker or broker is a person or company connecting businesses that ship goods (shippers) with trucking or other transportation companies for a fee. It is the transport of freight that fills up a full ocean shipping container to capacity (20ft or 40/45ft) or fills up most of the container at a better price than LCL. Total weight of the vehicle including its cargo. A tool used for lifting and moving pallets. A shipment that does not take up the entire available space of a 20ft. or 40/45 ft. ocean shipping container. LCL freight combines shipments from multiple shippers at a lower costs. Nested are goods that are stacked inside each other to reduce space taken during shipping. A request for an exact date and time or a window for pick up. Procurement is the process of acquiring goods, services or works from an external source, often via a tendering or bidding process. Proof of Delivery or POD is a document signed by the freight recipient or consignee, confirming time, date & condition of delivery. Rolling tarp system for protecting open load cargo. Special services provided by the carrier. For example, Call Before Delivery. A truck that can fit into narrow streets, e.g. streets in residential areas. A platform at the rear of the truck, used for loading and unloading heavy freight at locations without docks or forklifts. A tanker is a vehicle or vessel carrying liquid or gas cargo in bulk like petroleum, milk or natural gas. It can be a truck, train, ship, or freight aircraft. Covering of the flatbed load to protect it from elements. The total time of transit from pick up to delivery of the cargo. Online platform, application or on-premises system that offers shipment booking and management, documentation, data storage and reporting as well as integration with carriers and other systems. Weight per pallet, box, crate etc.